Drugs are manufactured in three dispensings: Sulf-120 for cats, Sulf-120 for dogs, Sulf-480 for dogs (6 tablets in blister). Outer package - carton. High efficiency in bacterial infections. Trimethoprim and sulfadiazine are active ingredients. 1 Sulf-120 tablet contains 0.1 g of sulfadiazine and 0.02 g of trimethoprim; 1 Sulf-480 tablet contains 0.4 g of sulfadiazine and 0.08 g of trimethoprim. Trimethoprim and sulfadiazine strengthen each other providing broad-spectrum antibacterial effect. The drug is active against gram-positive and gram-negative microorganisms (including E.coli, Clostridium spp., Salmonella spp., Proteus spp., Bacillus anthracis, Pasteurella spp., Haemophilus spp., Vibrio spp., Stapylococcus spp., Streptococcus spp., Shigella spp., Corynebacterium spp., Klebsiella spp., Fusobacterium spp., Bordetella spp. and Brucella spp.). The drug rapidly absorbs in blood and reaches all organs and tissues. Peak blood concentration is observed in 3-4 hours after administration and remains at therapeutic level at least for 12 hours. 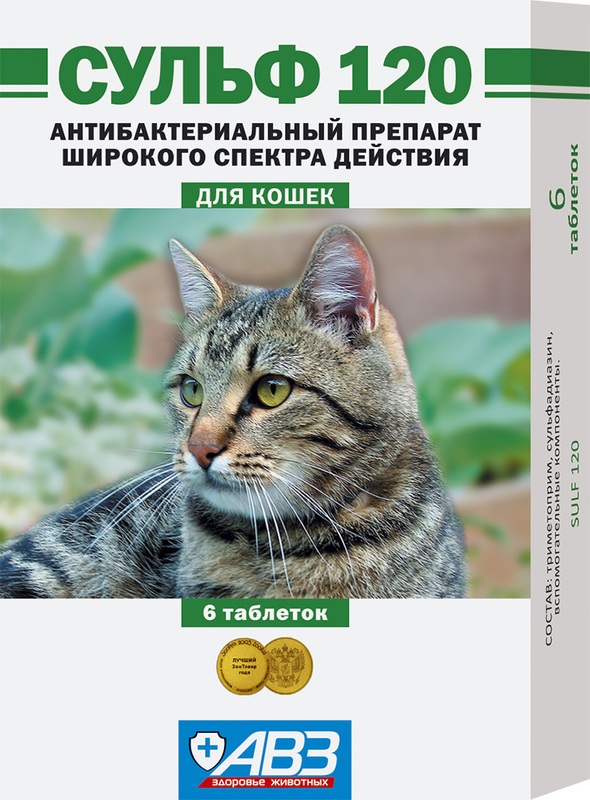 Use Sulf for treatment of dogs and cats with bacterial infections of respiratory system, gastrointestinal tract, urogenital system, skin, pasteurellosis, salmonellosis and other diseases agents of which are susceptible to trimethoprim and sulfadiazine. Increased individual sensitivity to sulfanilamides and trimethoprim, disorders of hematogenesis organs, liver or kidneys. Contraindicated for pregnant and lactating females. Administered with a treat. Daily dose: Sulf-120 - 1 tablet per 4 kg of body weight. Sulf-480 - 1 tablet per 16 kg of body weight. It is recommended to divide a daily dose in two portions and give it to an animal every 12 hours (in the morning and evening). Treatment course is 5-7 days. During Sulf administration adverse events and complications are not generally observed. Stop drug administration in case of increased individual sensitivity and allergic reactions. Store in closed original package. Protect from direct sunlight. Keep out of the reach of children and animals. Store separately from food and animal feeding at 0-25°С. Shelf life is 3 years from manufacturing date.